About the Children's Department: Involve Your Kids in Bringing God's Word to the Mwinika People - Put Feet to Their Faith! Involve Your Kids in Bringing God's Word to the Mwinika People - Put Feet to Their Faith! gather your children together and collect all their Bibles - place the Bibles in a box and set it aside. ask your children if they can read the Bible verse on their pages, then talk with them about how they would feel if the only Bibles they could ever see were in these languages. Ask them how they think they'd be able to learn about God and His love and grace if their only Bibles were in these languages. Other than having someone tell us about God, we can not have any way to learn to know and walk with God without having a Bible in our own language. This is the case with the Mwinika people in Mozambique. 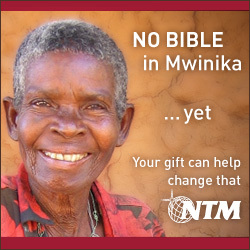 Check this link for a report about translating the Bible into Mwinkia from New Tribes Missionary Phil Henderson and share this account with the children in your ministry. Talk with them about what they can do to raise money to help fund the Mwinika Bible and spend time praying for the translators so they will have wisdom and clarity in translating the Bible and the Mwinika people so they will be able to learn of God and His love and grace!